The other day I consulted Betty to determine how to bake a butternut squash (to eventually purée for Jack). As I was flipping through I noticed that Betty has a vegetarian section. Huh. Did not know that was in there. 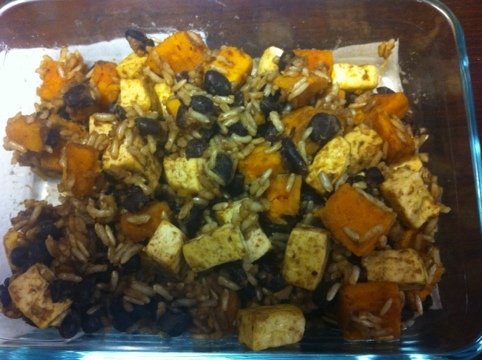 I glanced through the recipes and found one for sweet potato tofu jambalaya that looked really tasty. Lucky for everyone it’s posted online! I made this for dinner on Sunday night and meant to post it yesterday. However I’ve been reading this book called The Night Circus . Has anyone else read it? I’d love to know what you think. Anyway it was due back to the library yesterday and I’m trying to get it finished up so I can return it without too much of a late fee donation. Back to dinner. This recipe was very easy. Don’t be turned off by the tofu if that’s not your thing. You could easily leave it out and the dish would still be delicious. The recipe is written for white rice which I didn’t realize until after I threw in the brown rice. I tried cooking it a little longer but the rice never cooked all the way and the liquid was all absorbed. Even with the semi-crunchy rice the dish was very good. Benzo and I both enjoyed it and I will definitely make it again (with white rice). Worcestershire sauce contains fish so it is not vegetarian. There are fish-less varieties you can buy so read the labels if you want this dish to be completely vegetarian. I pressed the tofu as a big block wrapped in a towel between two plates with 4 cans on top. I left it for 2 hours, changing the towel halfway through. After pressing I chopped it into chunks. I left out the green onions because I didn’t have any. I used two cups of water plus two teaspoons of vegetable bouillon instead of one can of broth. This was such a fun combination that has generated more dinner ideas in my mind. Can’t wait to bring them to life!